How will the Modi Sarkar's likely return to power affect other nations? Sanjeev Nayyar attempts an answer. Then prime minister Indira Gandhi talked of the 'foreign hand' often. Now that poll dates are announced, the foreign hand in India's 2019 elections might become more visible. Also, there are many within and outside India who believe that the 'Idea of India' (read, Jawaharlal Nehru's vision for India) has been challenged for the first time since 2014. In such a scenario it would be interesting to indulge in some crystal ball-gazing, country-wise, on whether they want the Modi Sarkar to have another term, if a country can make the government's re-election difficult and, lastly, why some Indians want Modi to occupy the Opposition benches. At the outset I must state that this article is based on an evaluation of events and is not meant to cast aspersions on nations or individuals referred to herein. Further, I do not seek to make a case for this government's re-election. So, let us look at countries who matter to India. Notwithstanding China's burgeoning trade surplus vis-à-vis India, it would be happy to see a non-BJP government in Delhi for four reasons. One, this government's refusal to be part of the Belt and Road Initiative has upset the Chinese no end. Since then there have been numerous articles in the State-run Global Times tabloid, considered as a mouthpiece of China's Communist party, on how beneficial BRI would be to India, including for Kashmir. Two, the Chinese did not expect India to stand up to them during the Doklam encounter. The manner in which India, particularly the ministry of external affairs, handled the incursion is worthy of praise and noticed globally. Three, India's stand against Pakistan (China's 'irreplaceable all-weather friend') significantly hardened post the initial honeymoon period. IAF aircraft crossed the Line of Control for the first time since 1971 and the government took the fight inside Pakistan. An unstable Pakistan and an even more unstable Baluchistan are against Chinese interests. Therefore, the Chinese might make fresh incursions in Arunachal Pradesh, Uttarakhand near Char Dham, Siliguri or even launch a joint attack with Pakistan to seize the Siachen glacier. Why Siachen? Simply put, occupying the glacier means the Chinese overlook Leh. If the China-Pakistan combine succeed in occupying strategic space on Siachen, the Supreme Court may be immediately petitioned that the government be restrained from responding since the model code of conduct is in force. Four, it was in 2011 (external link) that the Vietnamese government first formally sought the Brahmos supersonic anti-ship missile from then prime minister Manmohan Singh. Reports of this government selling this missile appeared in 2016-2017, but nothing has moved since. Brahmos is important because it enables Vietnam and every other offshore State in the South China Sea to power project its deterrent capability 300 km away from its furthest ships which would act as an impediment to Chinese hegemony in the region. The Chinese are aware that the Modi Sarkar has the potential to break free from the past, and export Brahmos. After all, how long can Masood Azhar and the Wuhan spirit co-exist! In spite of century-old cultural relations between the two nations, China dislikes India. I experienced this first hand while working with the Chinese at the regional headquarters in Hong Kong in 1997. Probably, they are aware of India's contribution to their civilisation which even Indians don't know, or of her hidden potential. When Pakistan is pushed into a corner, like post-September 11, it seeks to deflect attention to India. This time round, Pakistan might use its sleeper cells to plant bombs at crowded places or election rallies, most likely in BJP ruled states, or even hijack planes. After all, was not the timing of Pulwama an attempt to tell Indians that Modi is a paper tiger who has failed to rein in Pakistan? For China and Pakistan, Modi's nationalist positioning has to be dented. Notwithstanding the US president's tweets on India's unfavourable trade policies and protests by the church, Trump would want Modi to be re-elected. Here are some reasons. One, India purchased crude for the first time from America in 2017. Two, the government signed defence contracts like for example the $3 billion deal for 15 Chinook utility helicopters, 22 Apache helicopter gunships and Rs 5,000 crores for 145 M-777 howitzers, Rs 7 billion contract to supply 72,000 assault rifles and is in talks for US MH-60R Naval Utility Helicopters and Sea Guardian armed drones, all worth $4 billion. Three, a strong leader would keep the pressure on Pakistan's eastern border and up the ante on Baluchistan, forcing it to be reasonable as the US seeks to exit Afghanistan. 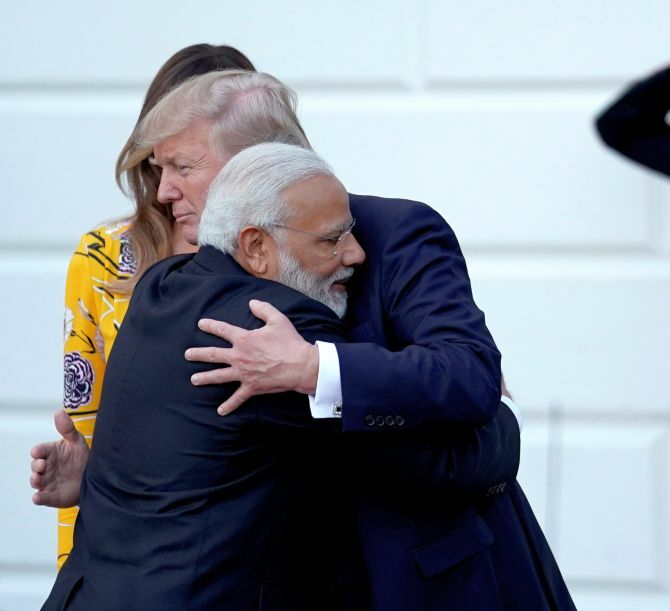 Four, Trump empathises with Modi in some way because like Modi, he to is fighting the equivalent of Lutyens Delhi in Washington, DC. Russia has joined hands with China to take on the US. It is working with like-minded countries to have a favourable regime in Afghanistan, for which it needs Pakistan. This and the China factor have made it soften its stand on Pakistan. Conversely, it has a longstanding friendship with India. The Russians will remember that this government signed the $5.4 billion S-400 deal. To this, add an estimated $2 billion contract to build 200 Kamov 226T light helicopters. Russia needs Indian orders to keep its factory lines buzzing. So notwithstanding the US being its primary adversary currently, it is not lost on the Russians that these orders are flowing in spite of the threat of US sanctions. Russia might also appreciate this government's ability to make friends with countries that oppose each other, for example Russia vs the US, Saudi Arabia vs Iran, and Israel vs Palestine. Putin might be happier dealing with a known leader for whom the national interest is paramount. Noted conservative strategist Bharat Karnad says, "The Russian government is indifferent about Modi returning as PM because it is convinced that India has nowhere else to go for frontline military hardware and strategic technology -- the central pillars of Indo-Russian relations, and that its alliance with Washington is a ploy to gain political manoeuvring space against China, which is not at Moscow's expense." "Further," adds Dr Karnad, "that to contain China -- and Putin believes Beijing needs containing -- may require separate and conjoined efforts of India, Russia and US. Whether it is Modi again or someone else in his place, this basic reality won't change." Going by current trends the Saudis might, notwithstanding Modi being an unapologetic Hindu, be happy to see his return. That would keep Pakistan under pressure, dependent on the Saudis and amenable to Saudi demands. The prime minister's personal equation with Gulf rulers could make India a balancer in Saudi Sunni vs Iran Shia differences. Harsh V Pant, professor of international relations, department of defence studies, King's College London, says, "My sense is that both Putin and Saudis would be much happier with a weak government in Delhi... A strong PM puts them in a difficult position as then they will have to be explicit in making choices." "The British government is in too much of a turmoil to think of Modi but most Europeans would prefer Modi given his tendency to work towards specific outcomes," Pant adds. The Indo-French relationship has two significant milestones. It was Modi and then French President Francois Hollande who unveiled the International Solar Alliance (external link) in 2015. To this, add the Rs 590 billion Rafale order. Both countries also share geopolitical interests of dealing with China's rise and its moves in the Indian Ocean, etc. It is a relationship with huge potential. Let us now explore why select groups would want Modi to occupy the Opposition benches. For the Congress party and the ecosystem popularly known as Lutyens Delhi, it is a do or die election. One can survive being out of power for five terms, but ten? Lawyers have managed to stay out of the gambit of service tax and GST. If chartered accountants are service providers, how lawyers are not is a mystery. Perhaps because past and present finance ministers P Chidambaram and Arun Jaitley are both lawyers. If Modi returns and the next FM is not a lawyer, then there is every possibility that lawyers would be brought under GST. The Left Liberals and those who believe the 'Idea of India' is under threat would surely not want to see Modi to return. The emergence of numerous digital platforms and social media have challenged their intellectual dominance. Notwithstanding the delays, promoters of companies, especially those affected by the Insolvency and Banking Code and “beneficiaries of phone banking”, are an unhappy lot. It was the Modi government which notified the 1988 Prohibition of Benami Property Transactions Act in 2016. Owners of benami properties are not pleased, for sure. As of October 2018 this government cancelled the FCRA registrations (external link) of approximately 20,000 NGOs since it came to power. Simply put, these NGOs cannot receive foreign contributions. Why do NGOs oppose the Modi government? A domain expert says, "The government has punctiliously enforced the FCRA rules. Thousands of organisations that were not submitting their returns regularly were penalised and had their registration revoked. Some prominent NGOs that had openly carried out proselytisation were penalised and were unable to receive money from abroad." "The new Darpan portal made the trustees and key players openly available. In many cases, conflicts of interest were identified and the organisation lost its registration or was revoked from the prior permission category." "However, this has not reduced the fund flows. The remaining registered NGOs have had their fund flows unaffected." In 2000, NDA 1 formed a panel headed (external link) by Justice V S Malimath to suggest an overhaul of the century-old criminal justice system. Nothing much came out of the report submitted two years later. Was it put in cold storage due to protests then or otherwise is unknown. At an Off the Cuff event recently Sanjeev Sanyal, principal economic advisor, Government of India, said the government is considering judicial reforms. Even though details were not spelt out, speedy justice surely is one of its objectives. This might be opposed by those lawyers who have benefitted from the 'tarik pe tarik' way of working. These are only some examples of groups adversely affected by this government. One thing is for sure -- 2019 is going to be the most hotly contested election in recent times. It shall decide the future of India in more ways than one.